I'm really pretty bad at cooking. Sometimes, veggies are rotten before you even bring them home. Sometimes, they’re just sitting on the shelf, hiding their dirty rotten secret under their glamorous purple skin, and you have no idea until it’s too late and it’s snowing outside and the curbs are already prepped for the “is it street or is it slush?” game and your cooking partner’s only pair of shoes is high-heeled leather (pleather?) boots. That is exactly the kind of night it has to be for you to discover that your main ingredient is just not going to make the cut. 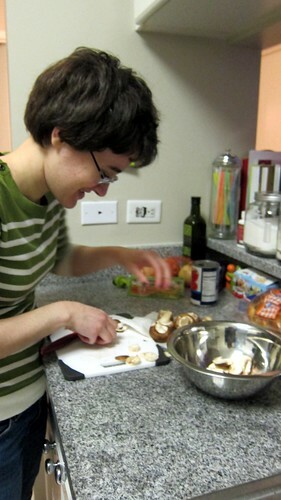 However, this cooking partner of mine (you all know her as the true owner of this blog) and I have been together for the better part of two decades, and mushy brown eggplant really can’t stop us. We’ve been cooking for longer than I can remember. Our middle-school selves were hooked on filming the process of preparing store-brand macaroni and cheese. Photos wouldn’t have been able to capture that titillating gushy noise you get while stirring the freshly cooked processed goodness. We once tried to make cheese out of skim milk. After that we made soft pretzels … with sprinkles mixed in. We eventually graduated to trying out the cake recipes in Betty Crocker’s Picture Cookbook (i.e. the quintessential guide to being a housewife), but to no avail (whipped egg whites does not a frosting make). I’d say our failures were due not to our own relative shittiness, but to the recipes themselves, and their incomprehensible lack of user-friendliness. And so, thanks to our almost-two decades of failures, it felt natural for us to be forced into the sparkly NYC snow, me in my galoshes, her in my two-sizes-too-big snow boots, to pick up a new eggplant, boyfriend in tow. And I’m glad we did. We also got a can of diced tomatoes to replace the bruschetta called for in the recipe (taken from The I Love Trader Joe’s Vegetarian Cookbook). 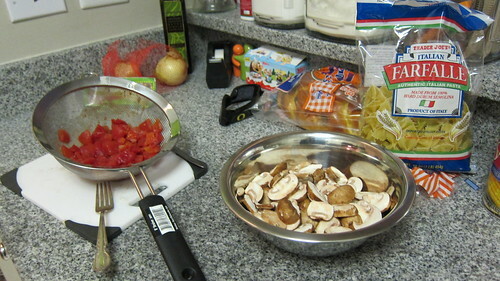 The recipe was a pretty basic veggie-over-pasta concoction. 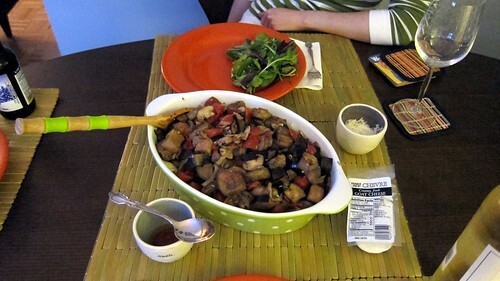 It was very wintery with eggplant, cremini mushrooms (Julie calls them “fancy mushrooms”), and bowtie pasta. We added one sweet onion, caramelized. I’ve always been a control freak in my kitchen, but I’m trying to loosen up and let Julie take the lead every once in a while. Even as I saw her pick up the bottle of olive oil without a measuring tool and carry it over to our frying pan, I let it happen. Then, I poured some of the olive oil from the pan down the drain. I guess I still have a ways to go on that one. So we caramelized the onions (I wish Julie had gotten a picture of me slicing the onions in ski goggles) and then added garlic, sliced creminis, diced tomatoes, and the new eggplant, which had been sweating for about half an hour. I threw in a whole bunch of Bohemian Forest Rub, a mix from Savory Spice Shop in Austin, TX. We let that simmer on medium-low heat for about ten minutes and cooked up the pasta. It all went into a big polka-dotted oval stone dish, with plenty of goat cheese available on the side. I am entirely convinced that everything I cook looks better in a round or oval dish. In the end, the eggplant was still a bit too bitter. I guess we should pay more attention to the seasons when we cook, or skin the eggplant first, or cut it into smaller pieces. I’d say the dish would have been phenomenal without the eggplant, maybe even served over toasted French bread. We rounded the meal off with a “mixed green” salad, red wine vinaigrette, five-buck pinot grigio, and an ooey gooey cinnamon square dessert (god bless Smitten Kitchen) that I’d prepared beforehand over ice cream. All in all, a wonderful snowday meal, and quite beginner-friendly and quick. And Julie overcame her fear of goat cheese. And I overcame my fear of Julie in my kitchen. 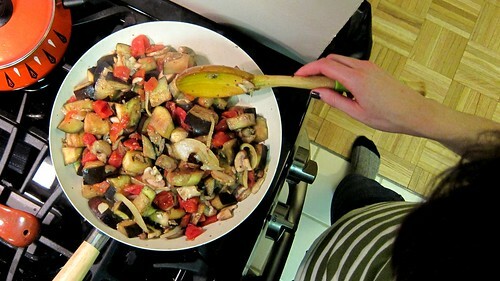 This entry was posted in Dinner, Pasta, Trader Jacqui, Vegetarian and tagged eggplant, mushrooms, onions. Bookmark the permalink. I enjoyed your post, Jacqui! (don’t worry Julie I won’t pay more attention to her). But I just wanted to say I know EXACTLY what you mean about the gushy noise when making easy mac (I assume that’s what you were talking about?). Also where are these videos?? ?